It was 1981 and we were new in Durban. We decided to watch the Comrades Marathon, an 89km exercise in insanity being run “up” from the coast at Durban to the heights of Sleepy Hollow that year. Those days it was easy to follow the race: You just got in the way, parked wherever and got out whenever you felt like shouting encouragement to the possessed. Early in the morning we stood near 45th cutting and soon the runners arrived. Near to us was a short old bald whispy-haired fella shouting enthusiastic encouragement and giving two-thumbs-up to virtually every runner, some of whom – quite a number – seemed to recognise him. Once the last stragglers had passed we started to head off to Dave’s green VW Beetle, but noticed the old bullet seemed lost. Can we help you? we asked. Do you know the way to the finish? he asked. Sure, and we’re going there, we said, wanna come along? I’d love that, he said gratefully, and that’s how two complete Comrades ignoramuses ended up driving Wally Hayward in the back of a Beetle to the finish of the 1981 Comrades – a race he had run five times AND WON FIVE TIMES! Well, you couldn’t spend a morning with Wally without hearing a whole bunch of tales and we milked him for more and fell under the spell of this warm and unassuming bundle of energy. At the finish we sat on the grass and heard an announcement that some old bullet who won the race decades ago was there and was going to do a lap of honour. The wonderful brave soul – I think Phil Masterson-Smith, the 1931 winner – shuffled slowly around the track to tremendous applause, none louder than that coming from Wally who watched intently, quivering like a bird-dog with a huge grin and a wistful look in his eyes. I winked at Dave and snuck off to the announcer’s tower and told them we had the 1930 winner Wally Hayward with us, and could they make a fuss of him, too? They could indeed and so, 51yrs after first winning the race Wally hit the track, totally surprised – but also totally chuffed – and ran that 400m with a smile like a truck radiator and his knees flying past his ears looking for all the world like an escaped ostrich! I bet his 400m time would have been way up there among the quickest ever for a 73yr-old! Yes, Wally had won in 1930, then again in 1950, ’51, ’53 and 1954! He had run this crazy ultra-marathon only five times in all and won it every time he entered, the last time at the age of 45, a record which still stood in 1981. It was only broken much later – in 2004. It took us a while to find him after his lap of honour, celebrity that he now was, but yes, he still wanted a lift back to Durban please. I s’pose he didn’t know the way! Six years after we enjoyed this magic day, Wally ran Comrades again, thirty three years after his last run and shortly before his 80th birthday. He ran a magnificent race, beating half the field and beating the winner Bruce Fordyce on an age-handicapped calculation. Bruce himself mentioned and emphasised this after the race. Wally’s memoirs were published in time for the 1999 Comrades by a wonderful friend of mine, fellow Comrades runner and Dusi paddler Bill Jamieson. He titled the book: “JUST CALL ME WALLY”. 89km in 9hrs 44mins just before his 80th birthday. Wally died in 2006, aged 97. Well this does bring back memories – 33 years ago at that! Actually, we originally only planned to go as far as Fields Hill. 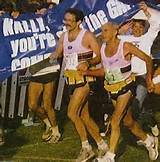 When Bruce Fordyce past us outside the Westridge Park Tennis Stadium, with his bunch of early race ‘klingons’ and yelled out ‘Walleeeee’ as he strode past the great man – we knew we were dealing with someone special. The rest you’ve said. I’d forgotten that! It was Fordyce’s first win that year. The first of nine. In the back of my mind I thought we did know there was something special about him, but we weren’t sure who he was. When he asked for a lift, did we already know who he was? No, we did not know who he was. When he asked for a lift, he told us that he was there with his mate, who wanted to follow his son who was a plodder at the back of the field. Dear Wally just assumed that we, like him wanted to watch the front runners. As it turned out, Wally was wrong – we just wanted to be with Wally! Among many other running achievements, Wally had also won the Harrismith Mountain Race. Well this does bring back memories – 33 years ago at that!! Actually, we originally only planned to go as far as Fields Hill. It was Fordyce’s first win that year, I think.